Henry's an extremely knowledgeable violin maker who takes time to know what's right for each individual customers � what they need and can afford. 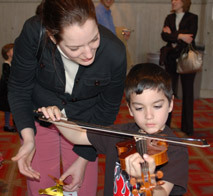 David Waltman's 10-year-old son, Liam, plays a violin from Bischofberger. I want to say thanks for taking the time to discuss my daughter�s not so great violin with me yesterday and also for tweaking the sound post for us. Even though you were very busy and we arrived without an appointment you still patiently and kindly took the time to educate us and offer good advice. As well as a luthier/violin maker you are a gentleman. I can see why your shop is bustling with customers, you�re honest and ethical. Just have to take a moment that is filled with gratitude for the wonderful generosity you all have given to the RHMS/Elementary string programs.I could not do my job without you! As the weather turned, your instruments were a joy to tune as I prepared 77 students for Friday morning class. I smiled with each instrument and sent you energy. Oh so grateful! I am proud knowing that your rental families are investing money in an instrument that sets their musician up for success. I have had the great pleasure of knowing Henry for 7 years. Over that time we have purchased instruments and bows as well as having repair work done. His expert knowledge has enabled us to select the perfect instrument and bows for our daughter. We were never rushed into making a decision and at all times were shown the utmost courtesy and kindness. 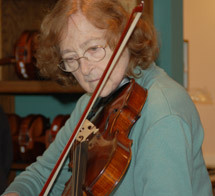 To have a professional violin maker on the Eastside is wonderful. To have that person be Henry is even better. I would never dream of going anywhere else. We put on the Aronoff Chamber Music Festival and Series at Bastyr University each June. I feel Henry Bischofberger is one of a few really reputable instrument dealers in the area. I am a private violin and viola instructor and in the Spring I gave a master workshop for viola students and teachers at Henry Bischofberger Violins and will continue again next Spring. It was very successful! He has an "impressive pedigree" as a Swiss-trained, third-generation violin maker, but more importantly he's got a great instinct of his own for the instruments and bows he chooses to deal in. I think Henry's shop has a beautiful collection of inventory already since he opened. I am so impressed by the fact that he answers his own phone and does his own work. Henry is a staunch supporter of our school's music program - he provided music stands for the school at wholesale. He knows his business. He's personable, friendly and talented and he knows how to play the violin as well as make and repair them. My daughter, Maialen, plays a viola rented from Henry Bischofberger Violins. We were his very first customers when he opened his shop on the Eastside!